Monkeyflower capsule The Peralta Community Gardens is one of three gardens in the Westbrae neighborhood. Berkeley Daily Planet reporter, Marilyn Claessens, dubbed the area "an ecological neighborhood" in a 2000 article on the coastal prairie habitat planted along the Ohlone Greenway by CHIA (California Habitat Indigenous Activists). On the last Saturday in May of this year I volunteered at a CHIA work party. I will write about the May work day as well as the history of the CHIA habitat project at a future date. I met an incredible group of people and keep in touch via a CHIA email list. Yesterday, I worked with the group again, this time in the garden and not along the Ohlone Greenway. I helped to collect seeds from the showy milkweed (Asclepidaceae speciosa), the soap plant (Chlorogalum pomeridianum), and monkeyflower (genus Diplacus, I think). The soap plant seed was the easiest to collect; large, hard seeds held in a dehiscent* fruit that easily fell into our envelopes. 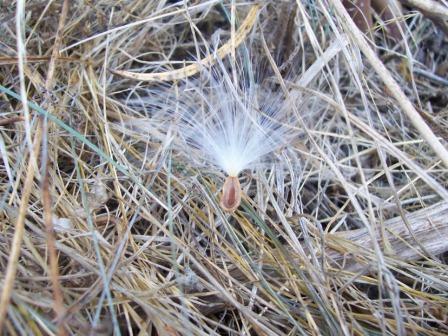 On the other hand, the showy milkweed seeds are wind dispersed and there was a slight but constant breeze which blew the seeds directly out of the follicle* or blew the seeds from one's fingers. Despite this challenge, the showy milkweed seeds are incredibly soft, like down. 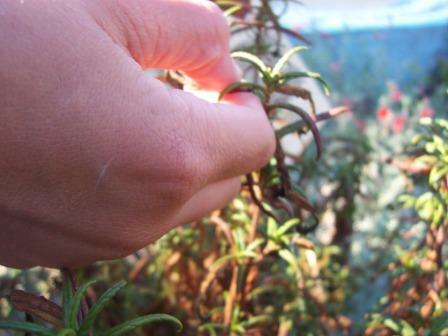 The monkeyflower seed posed its own challenge. The seeds are very small and are held in a capsule that I found difficult to open. 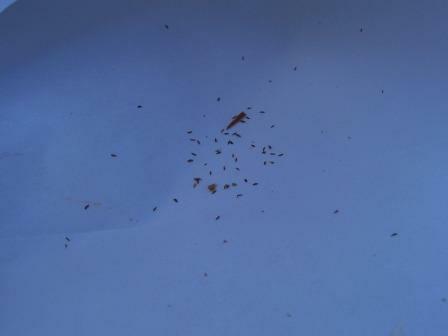 Some of the seed collectors had better luck (skill) extracting the seeds from the pod. After a few less than stellar attempts at removing the seeds, I resorted to collecting whole capsules. left, Showy milkweed fruit Showy milkweed seed left, Monkeyflower seeds Soap plant I took a few showy milkweed and soap plant seeds home (with permission). 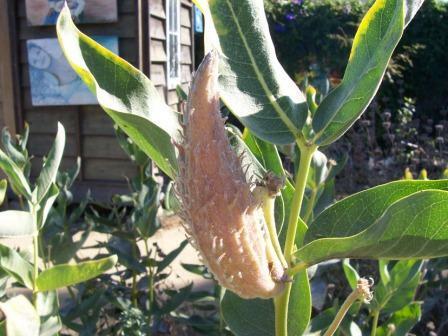 The milkweed is a "butterfly favorite" (Endicott, Northern California Gardening). The showy milkweed is a host plant for the Monarch butterfly (read more about this plant-butterfly association). Other "butterfly favorites" include lavender, mint, and rosemary, all of which I grow in my garden. 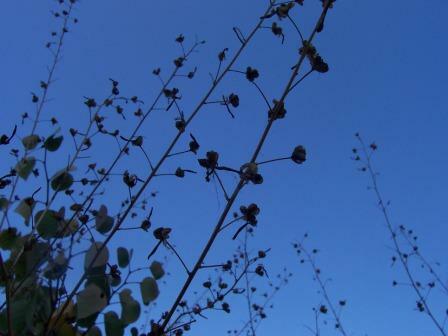 The Peralta Community Garden is planted with many native perennials, but annual food crops are also grown. The tomatoes, squash, and zucchini are ripe and many. I also noticed a Three Sisters Planting of corn, beans, and squash. The Three Sisters is a form of companion planting. It seems a good metaphor for community-based gardens: each plant provides a necessary element for the success of all the plants. The corn provides support for the beans while the beans provide soil-based nitrogen and the squash shade the soil, keeping the roots cool, trapping soil moisture, and suppressing weeds. Darrols, The Food Gardener blogger in southern New Mexico, has studied the three North American Three Sisters Planting styles. I cannot create a Three Sisters Planting in my garden (not enough space), but if I could I would try the Zuni Waffle Garden, designed for water conservation in arid, southwestern landscapes (the most similar in terms of moisture, at least, to the East Bay). * Dehiscent: "a fruit that opens naturally to release the enclosed seed or seeds" (Harrington, How to Identify Plants). * Follicle: "a dry, one-celled, one-carpellate fruit splitting down one side only, as in the milkweed" (Ibid.). Good coverage of this project; I have a plot at Peralta and so know some of the folks involved in the project -- a nice group of people! It has been interesting to see all of the corn growing this year. I've never attempted it in Berkeley because there doesn't usually seem to be enough heat for it, but this year people are getting some good crops. I just noticed a big crop of corn yesterday on Grant street (it might have been around Dwight -- one you mention in your next post). I enjoy volunteering for the CHIA project and it's always great to hang out at the garden. Will you attend the September 16 garden party?